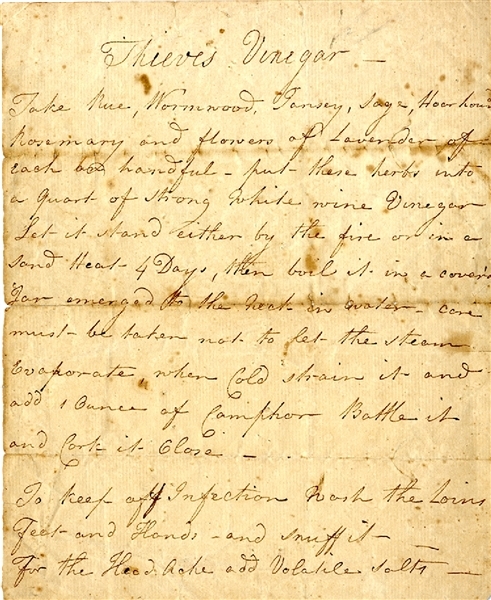 Manuscript Document “Thieves Vinegar” 1pp. quarto, on laid paper, c. late 18th or early 19th century, with receipe for this pirate brew. Fine condition. Four thieves vinegar (also called Marseilles vinegar, Marseilles remedy, prophylactic vinegar, vinegar of the four thieves, camphorated acetic acid, vinaigre des quatre voleurs and acetum quator furum) is a concoction of vinegar (either from red wine, white wine, cider, or distilled white) infused with herbs, spices or garlic that was believed to protect users from the plague. The recipe for this vinegar has almost as many variations as its legend.